What is a Torque Multipliers? It is a simple gear box, works on the principle of ‘Epicyclic Gearing’. The given load at the input gets torque multipliers as per the multiplication factor and transmitted at the output, there by with a minimum efforts you achieve greater load. Hand Torque Multipliers incorporate an ‘Epicyclic’ or ‘Planetary’ gear train having one or more stages. Each stage of gearing increases the torque multipliers applied by a factor of 5, allowing to offer torque multipliers in ratios of 5:1, 25:1 and 125:1. In the planetary gear system, torque multipliers is applied to the input gear or ‘Sun’ gear. Three or four planet gears whose teeth are engaged with the sun gear and therefore rotate. The outside casing of the torque multipliers, or ‘Annulus’ is also engaged with the planet gear teeth, and would normally rotate in the opposite direction to the sun gear. A reaction arm prevents the annulus from rotating, and this causes the planet gears to orbit around the sun. The planet gears are held between input and output plate which also holds the output square drive. Therefore as the planetary gears orbit around the sun gear, output plate the and so the square drive turns. Without the reaction arm to keep the annulus stationary, the output square will not apply torque multipliers. Why use a Torque Multipliers? Safety - Use of long levers can be dangerous. Torque Multipliers mean a reduction in the lever length or operator effort by a factor of 5, 25 or 125. Space Limitation - The use of a long lever may be impossible due to restricted space. Accuracy - Torque Multipliers will be applied most accurately when it is applied smoothly and slowly. 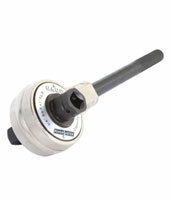 Torque Multipliers enable this by removing much of the physical effort from the tightening task.